The hottest summer of the twentieth century. A tiny community of five houses enclosed by wheat fields. While the adults shelter indoors, six children venture out on their bikes across the scorched, deserted countryside. Whilst exploring a dilapidated and uninhabited farmhouse, nine-year-old Michele Amitrano discovers a secret so momentous, so terrible, that he dare not tell anyone about it. To come to terms with what he has found, Michele has to draw strength from his own sense of humanity. 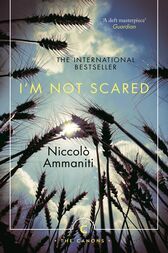 It is Ammaniti's ability to inhabit the mind and perspective of his young hero that makes I'm Not Scared such an affecting and extraordinary novel. The book is a masterpiece of coming of age; a compelling portrait of losing one's innocence and a powerful reflection on the complexities and compromises inherent in growing up. Niccolò Ammaniti was born in Rome in 1966. He is the author of several novels translated into English and two short story collections. Several of his novels have been adapted for film, including Steal You Away, which was longlisted for the Independent Foreign Fiction Prize, The Crossroads, winner of the Premio Strega Prize 2007, and the international bestseller I'm Not Scared, which won the prestigious Italian Viareggio-Repaci Prize for Fiction and has been translated into thirty-five languages.Translated from the Italian by Jonathan Hunt. Hunt divides his time between Italy and Britain. His translations include Niccolò Ammaniti's The Crossroads and Steal You Away, Nicolai Lilin's Siberian Education, Luca Rastello's I Am the Market, and Giorgio Vasta's Time on My Hands.